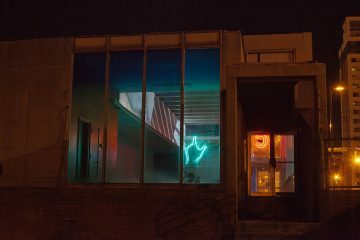 In 1888, the Huztler Brothers Palace opened on Baltimore’s Howard Street as a “museum of merchandise.” In 2017, the building serves as host to a vast internet server farm, but its museum status finds renewed life as the location of The Contemporary’s latest site-specific installation: The Ground by New York- and Richmond-based artist Michael Jones McKean, where whiteness, bright lights, theatricality, and obfuscation read more like a New York gallery than a contemporary Baltimore installation. The Contemporary acknowledges that McKean is interested in the building’s service as a kind of funnel, where the physical and digital were/are dispersed for mass consumption. As a department store, Hutzler’s was a collecting and viewing point for consumer products and now, computers process and store a trove of digital information at the site. The artist has taken an alien view of this process, as if he came across this place at a later time and unearthed it, studying it as today’s archeologists look at past cultures and civilizations. At its core, The Ground is about place and who or what belongs there. 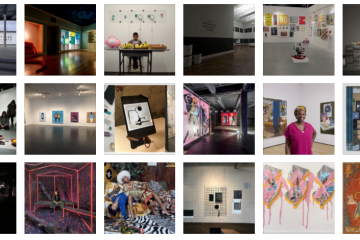 The exhibition, Deana Haggag’s last as Executive Director of The Contemporary, is a testament to how hard she has worked to bring The Contemporary back to its site-specific roots. 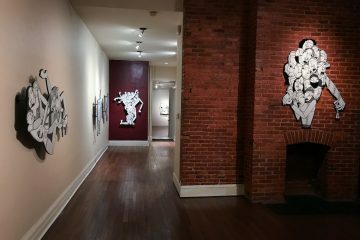 It is also an interesting foil to Founding Director George Ciscle’s 1992 Mining The Museum with artist Fred Wilson at the Maryland Historical Society. Wilson scoured the MdHS for items left in storage, away from viewers’ eyes. Those items told the story of racial ‘outsiders’ and the way that they were depicted or left undocumented from history. 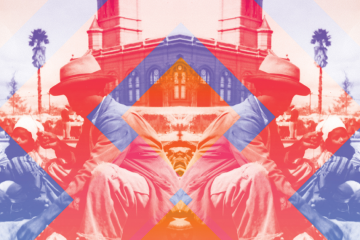 Where Wilson used the MdHS to tell Marylanders something about themselves, McKean created the future of a museum as he sees it—nature made sterile by the progress of technology; modern society unearthed, distorted and understood through a lens of time and space. McKean’s art historical and museological references are wide reaching but lack specificity, which could either be true to his alien-like, archeological point of view or a scattershot approach. Either way, The Ground creates pockets of inclusion and exclusion between visitors who ‘get it’ and those who don’t have the mental footnotes to follow all of McKean’s citations. The artist presents the viewer with a two-story structure, which fits comfortably in Hutzler’s cavernous first floor. Each side is broken into three sections like the triptych structure of a Christian altar painting. 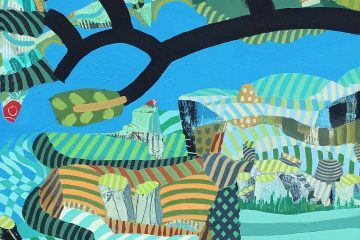 Within each segment, McKean has created scenes out of a natural history museum. The first vignette that visitors encounter after the exhibition statement is a bright, white display reminiscent of Sol LeWitt’s grid and cube sculptures. 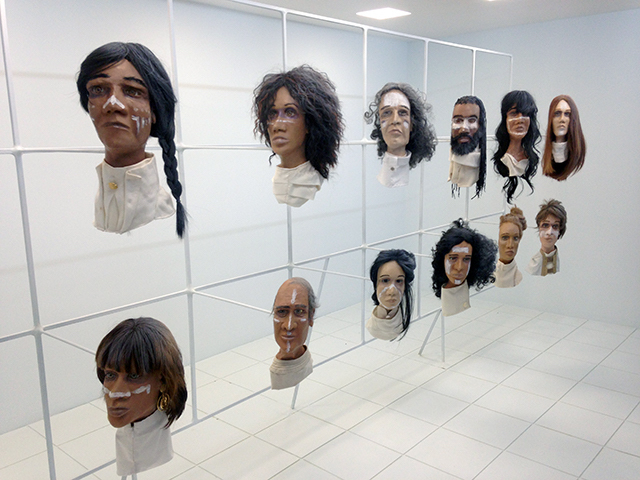 This space contains a dozen wig mannequins with ‘tribal’ markings painted onto their variously pigmented faces. Above them are copies of sculptures ranging from a Chinese Buddha to the bust of a Greek youth to an abstract head. These faces are smooth, white and positioned above the seemingly human heads. The symbolism and hierarchy implies the purity of gods but also a whitewashing of history. 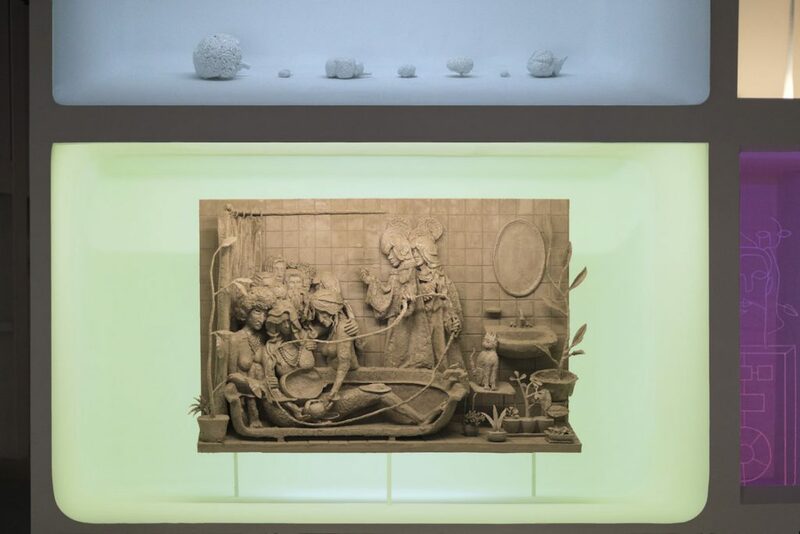 At the far left of the front side of McKean’s installation, a brown-gray sculpture depicts a water birth that calls to mind Italian Nativity scenes, frescoes and ceramics of the Della Robbia workshop. A naked woman is spread-legged in a cross-section of a tub. She is attended by two bare-chested women and watched by a crowd of heads behind them. Two ‘angels’ with brain-like haloes hold the umbilical cord. In a gesture of blessing, the one closest to the main group holds two pairs of lips suspended on wire. Above the birth scene, seven whitewashed brains of various sizes echo the angels’ haloes. 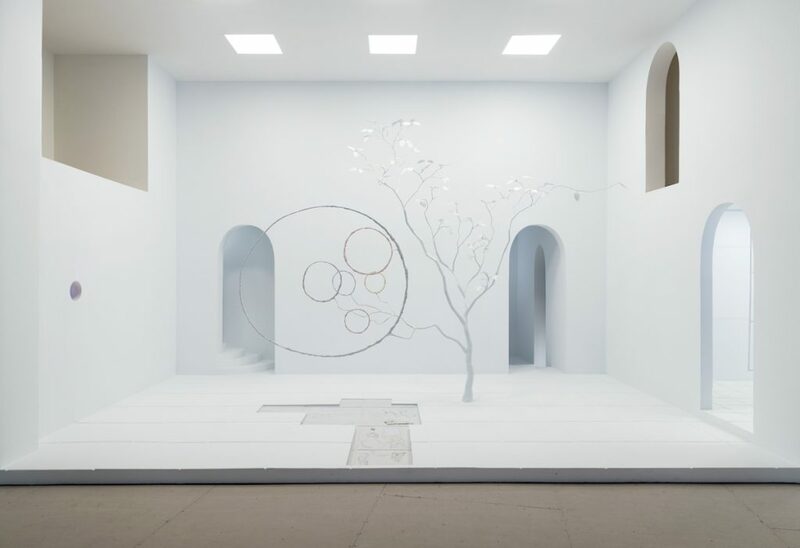 Looking at McKean’s past installations on his website, it becomes obvious that he used the collaboration with The Contemporary to realize his aesthetics on a larger scale—this time, a full museum instead of a single exhibition case. But, in places, he seems at a loss for what to do with the extra space, with the back side of the installation conspicuously empty compared with the front. On the back side, the center unit featured a few lights whose colors show their complement when you blink (i.e. the green light looks red). The white rooms of a house (to the right) could reference a period room in a museum but they appear as more of a backdrop for a performance or experience and don’t tell much of a story. The dead spaces in McKean’s installation do allow for the Huztler building to peak through and the space becomes art itself. Decoratively topped columns match the whiteness of the space, fading into a gray industrial ceiling. On the ends of McKean’s two-story installation, ladder-like steps in the wall lead to trap doors with light leaking out around them. At the top of each door is a light—red on one side and a regular yellowish-white on the other. Is this a remnant of the installation process or an invitation to climb into the second-story of the exhibition? Was I supposed to want to climb inside? And if so, why? 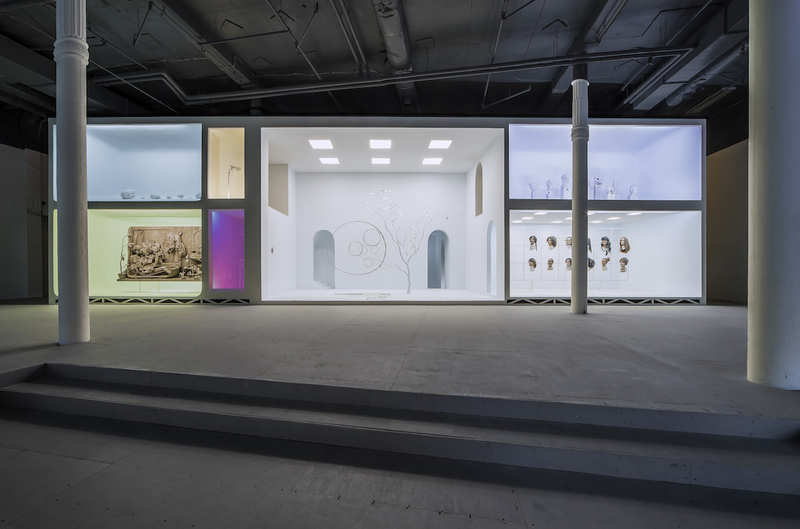 Along the side of the installation, a set of specimen refrigerators holds seeds, stones, shells, a single bone die and other objects that are difficult to define in murky darkness. Next to these is an illuminated shelf with two drawers above it. The drawers have holes in them—easy to grasp and open. They contain a key to the refrigerators and extra small, clear, specimen containers, like those in the coolers. At the opening, a lively debate broke out about whether you were supposed to open the cases. No one did while I was present, but one of The Contemporary’s interns would occasionally show up to say not to open the drawers. Conspiracy theories about experiments in social control sprung up—were you supposed to be ‘The One’ who would dare to open the cases or was it just a poor way to store the tools of installation? Although this wasn’t clearly on purpose, it was interesting to find that mundane elements became part of the show. The guts of a thermostat inside a clear case with keys dangling from it teased viewers to look, tempting them to touch. Again, were these unintentional remnants of Hutzler’s or part of the art? These details remind me of the teenage prank at the San Francisco Museum of Modern Art last year, where a pair of glasses on the floor tricked tourists into thinking that it was art, sanctioned and displayed by the museum. Many people took pictures, which may have made it into personal files, photo albums and collages of a trip to the museum, but the joke was on them. Another side note, the site of McKean’s installation brought about odd juxtapositions between people, in an exhibition about ‘space.’ During opening night, the immediate area was flooded with guards and parking attendants on duty, who seemed out of place in the typically uninhabited, upper corner of the Downtown neighborhood. 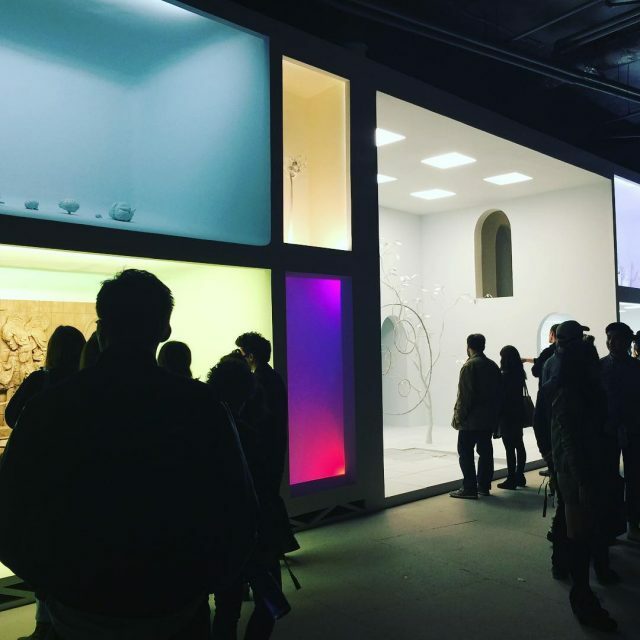 You could instinctively tell who was there to go to the opening—white moths in their finery, flocking to the bright, white light of McKean’s installation. The theatricality of the work drew them in, even if they would be met with questions and superficial references. This creation of an exclusive ‘white cube’ art space in the middle of a neighborhood that is past the glory days of the Hutzler Palace is an odd mood for The Contemporary, whose last installation–Abigail DeVille’s Only When It’s Dark Enough Can You See The Stars in the former Peale Museum—closed with a drumline performance and kids racing around the historic, installation-stuffed building. Comparatively, The Ground felt more like a stereotypically pretentious, New York opening, especially those depicted on TV or in film. Perhaps DeVille and McKean, along with The Contemporary, had similar goals in exploring the places of these exhibitions but with opposite audiences in mind? 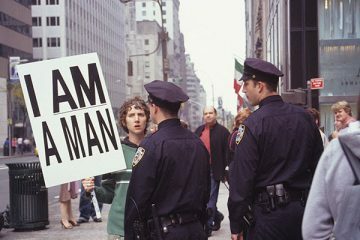 While DeVille’s installation made black and brown people feel included, McKean’s can make whites uncomfortably aware of their systemic power to exclude, even when inactive and unintentional. However, if this is his aim, it fell short, since visitors to the opening seemed more focused on solving the riddle of Meaning and eliciting positive feedback to their ideas. Although they allude to race, and Hutzler’s historic whites-only shopping policies, the exhibit is not direct or provocative enough on this topic. In The Ground, McKean presents us to ourselves as if we have travelled with the Ghost of Christmas Future to see our own extinction and what future beings know and think of us. But, perhaps it’s himself that McKean needs to examine. Why does he only touch the surface of complex topics like race, consumerism, and climate change in his work? It reflects (without examining) the short attention span that Generation Y is so often accused of. There are so many artists who have used the museum model successfully to make poignant cultural statements in ways that were more inclusive and transparent than McKean, who seems to have employed staid formulas for presentation. Fred Wilson (as mentioned) and Andrea Fraser’s institutional critiques in the form of ‘fake’ tours at the Philadelphia Museum of Art (1989) were both able to radically employ a museum’s delivery system and to make it welcoming to a diverse group of viewers. In contrast, The Ground glowed with a mysterious theatricality, which drew in close to 1000 visitors the night it opened, but left many of the visitors scratching their heads and feeling left out of a conversation they couldn’t access. Although the exclusion of neighbors to the Hutzler building—people outside the art community—doesn’t appear purposeful, it is an oversight. Positing art as a linear device that delivers meaning to some and not to others, as if there were a special key to unlock it, can be a fun game to play and initiated a lot of conversation. However, it doesn’t encourage viewers to reflect on themselves much, as they were so focused on solving McKean’s riddle, where the objects present were subordinate clues. People who ‘got it’ wanted their theories heard, admired, acknowledged and accepted by their companions, while others chose to appreciate the spectacle from a distance without risking engagement and looking dumb. Despite what anyone thought (or thought they knew), McKean was the Sphinx with the key to the exhibition, one he wasn’t sharing. He combined bright lights, cases requiring close examination and larger displays that seem designed to shock more than express or examine. While The Contemporary—a museum without a site or collection—questions the definition of a ‘museum,’ and has done so very successfully in the past, perhaps it is time for them to stray from artists who create museum-like installations and study other formats. Author Aden Weisel is an art historian and administrator with a background in curation. 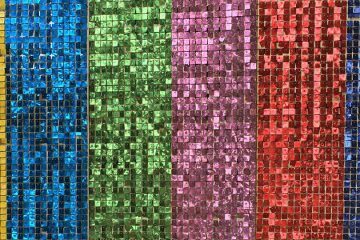 The Ground by Michael Jones McKean, is up through May 19, 2017, with a Performance by Sonic Meditations Saturday, March 25, 11am-4pm and a Curatorial Tour Saturday, April 1, 12-2pm. Thank you for this insightful and well written article about a confusing show. Your thoughts on it really bring to light what the artist was saying and what the show was about. I especially enjoyed the connections to older shows and the idea of the social experiment. Excellent job, I look forward to more of your writing!